I admit, macaron madness has fully infected the foodgeek household. I must have made at least 7 batches of macarons trying to get a recipe to come out. I’d have entire pans of cracked cookies, pans that only half of them cracked, and others that were perfect. Do not fold the ingredients like you would a cake. The batter needs to be deflated a good deal to get that ‘flows like magma’ consistency. Drying the macarons out before they are cooked provides insurance. While it may not be necessary, I found that the dried batches I made almost never cracked and always formed a proper foot. If you add coloring, do so to the egg whites at the end of beating and before folding in the dry ingredients. With all of the mistakes I made, there was a good deal of success. 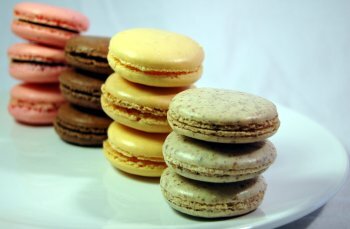 At the end of all of my experiments, I was able to produce four sheets of uncracked macarons. With those four sheets, I managed to come up with four separate flavors: chocolate, lemon, raspberry, and banana caramel. Place almond powder and powdered sugar in a food processor. Process with metal blade until thoroughly combined. Beat whites in a bowl with an electric mixer at high speed. As the whites begin to foam, add sugar in a slow stream while mixing. Continue mixing at high speed until whites reach stiff peaks. Immediately fill a pastry bag fitted with an 11mm round tip and pipe into rounds onto a baking sheet lined with a silpat baking mat. Rap the baking sheet a few times firmly on the countertop to flatten the macaron. 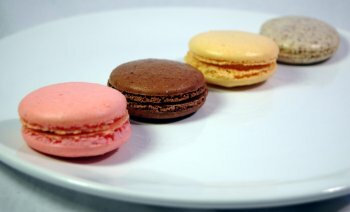 Leave macarons out to dry for about 30 minutes or until they do not stick to your finger when touched. When macarons are sufficiently dry, place in the oven to bake. After about five minutes, a ruffled skirt should develop around the bottom edge of each macaron. Rotate the baking sheet by 180 degrees, and bake for another five to seven minutes. Move silpat to a cooling rack. After macarons have cooled enough to touch, remove them from silpat and place upside down on rack. If they do not easily come off silpat, place in freezer for a few minutes and try again. Have you ever tried Lavender Macarons? I really love it but do not know what kind of essence they use? I can’t believe you tried to make 7 batches one right after the other. I think I would have gone crazy! If macarons were ugly I don’t think we’d be nearly as obsessed with them. But they’re not ugly, they’re cute and you can pretty much experiement with any flavour you want which makes for infinite possibilities. I’ve been thinking about doing a taro macaron. Sandi: I’ll be testing out a few versions this weekend. Keep your fingers crossed for a winner! thank you for a detailed explaination. Can u kindly share the chocolate macs recipe as i love this particular flavour very much. I add the food coloring when the eggs are almost fully whipped. I then let the machine run until the whites are colored fully. I actually have a different recipe for chocolate macarons. Some of the almond meal is replaced with cocoa powder. For the green tea, I just add matcha tea to this recipe. I use large eggs, the white should weigh 30g. Banana caramel is caramel with banana puree added to it. It’s basically a dry caramel that is deglazed with banana puree and rum, then cooked until thick. As for piping, I’ve had lots of practice. I just pipe small rounds, they should flatten out by themselves (and after you rap them on the counter). Absolutely love yr coloured macs but still lacks of guts in making them. When i add the colouring to the whipped whites, do i mix until the whites are fully coloured before adding the almond meal mixture? How many grams should i add for chocolate n green tea macs. Do i need to deduct the amount from the almond meal. What size of eggs do u used 4 yr macs, i usually use large eggs (70g). Will this be a problem? What is banana caramel..is it an essence to be added to the macs because i love the taste . How do u pipe yr macs? Do u start fm the middle and push the piping downward and let the batter form its rounds. I can try! Do you have a recipe you like to use or are you using mine? Why don’t you send me an email at chef*@*myfoodgeek.com (remove the *) and I’ll see what I can do. hi there! ive made macarons 5 times, sometimes this method, and others using a sugar syrup….but all the time they fail….cracked……no feet…..marshmallowish ( i know…crazy)…..and then hollow. i cant stand the hollow macarons. and a lot of the time they tend to rise on one side and not rise on the other side……can u help me?????? Eileen: After I pipe out a full sheet of macarons, I grab the pan with both hands and smack it on the counter a few times. This should flatten the tops and spread them out a bit. They should be spreading a bit on their own while you pipe them, as well. If they aren’t you probably aren’t folding enough. I found that you really need to fold quite heavily to get everything combined. one question: How did u flatten the top of the macarons? We love those things and yours look delicious! For the banana caramel and the chocolate, I used the Trader Joe’s almond meal (not blanched). For the berry and the lemon, I used Bob’s Red Mill. Today I just got some of the Honeyville Farms almond meal which I’ll have to try out. It looks much finer than Bob’s (and a fraction of the cost). Food blogger party would be cool. I’d throw one if I had a yard. Gorgeous Jef! What kind of almond meal did you end up using? I am thinking about throwing a food blogger party at my house in the early summmer if we can get our yard finished – so maybe you’ll get a chance to share them! Nice job, they look delicious. The can be very difficult but well worth the effort.